Swimming laps is an effective cardiovascular exercise that can burn 500 or more calories per hour. Swimming develops strong muscles throughout the body, especially in the legs, hips, shoulders and back. Swimming also enhances your lung capacity more than other cardiovascular exercises due to the time between breaths. A few tricks to balance your work and rest times while swimming can help you burn even more calories. According to Diet & Fitness Today, the average woman, at 163 pounds, burns 581 calories in one hour of swimming if you are using the front crawl and alternating strokes with your arms and legs. 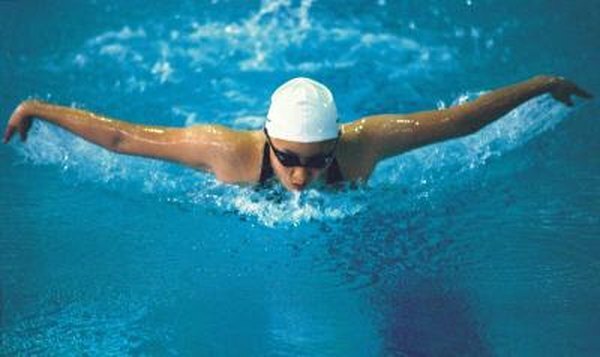 If you use the butterfly stroke, where your arms and legs move together in an explosive motion, the average woman can burn 813 calories in an hour. Mark Schubert, head of the U.S. national swim team and seven-time Olympic coach, says you should aim to keep your heart rate at 80 percent of maximum throughout your workout. To estimate this number, subtract your age from 220 and multiply by 0.8. For example, if you are a 40-year-old woman, you would multiply 180 by 0.8 for a maximum heart rate of 144 beats per minute while swimming. You may not be able to swim at a vigorous rate for an entire hour, but you can vary your intensity to keep your heart rate elevated. Many professional swimmers use a technique called ladders and pyramids, where you ramp the intensity or duration up and down. You should try to swim some of your laps as fast as possible. If you spend more than 10 percent of your swim time resting, you're losing out on burning calories. Schubert recommends cutting your rest between intervals or laps to 10 seconds. You can alternate between swimming brisk and leisurely laps to avoid stopping altogether. If you find yourself short of breath, flip over and swim the backstroke for a few laps until you catch your breath. Swimming back and forth in a pool using the same stroke at the same rate for an hour can become dull. Alternate laps between four main strokes: front crawl, backstroke, breaststroke and butterfly. You can use swim fins, hand paddles, kickboards or buoys that fit between your legs to rest or emphasize working your arms or legs.